Under the leadership of a new CEO, the Kings Fair in Hanford is looking forward to the 2018 fair, which will take place from June 7-10. Jerome Coelho, 22, is the youngest person to run the Kings Fair in recent memory, but he feels confident that his youthful energy will help infuse life into the local fair. He is replacing Angie Avila, his grandmother, who worked for the fair in various capacities for 30 years. Since childhood, Coelho spent time helping out at the fairgrounds under his grandmother’s watchful eye, performing tasks like weeding flowerbeds. 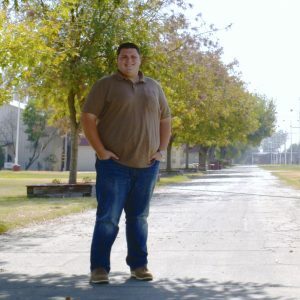 After graduating from Lemoore High School, he took on a paid position at the fair while attending Fresno State. For the past two years, he’s been working for the fair full-time, while also taking full-time college classes. He admits that the CEO position is one that he’s been working towards since his first volunteer position in the Kings Fair’s livestock department in 2014. To increase his knowledge of the fair industry, he spent time working for the Tulare County Fair, and five summers working for the Napa Town and County Fair. He graduated from Fresno State with a degree in ag business in December, just before assuming his role as the fair’s new CEO. Coelho has big dreams to make the Kings Fair an event the entire community will enjoy and support. There are plans in the works to implement some new year-round events that will bring people out to the fairgrounds, but for now, his focus in on the 2018 Kings Fair, which is only three months away. For more information about Coelho’s role or the 2018 Kings Fair, taking place June 7-10, please call the Kings Fair office at (559) 584.3318, or email [email protected].